FIXYOURTHINKING.COM / Need a brain? Borrow mine! : BillWhispers?? You know ... I have an IQ of 154 - I have tested as high as 170 on some tests, but I don't go around bragging about it. I hate egotrip websites that portray the sentiment ... this site and my job - are all about me and how smart I am ... how I will make money off of your visit ... see ... I have comments ... see I have advertisers which seem to endorse me. One web entity that has always rubbed me the wrong way, mostly due to his ego; is Bill Palmer. Bill has been around the Mac Web for some time. 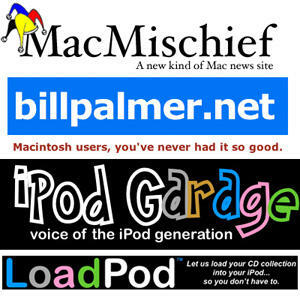 He started the sites; iPodGarage, LoadPod, MacMischief, BillPalmer.net and probably a dozen others that no one cares about. Each site has commentary from Bill that is usually nonsensical, poorly thought out, or just recycled generic editorial content that is passed off as original. These sites are very rudimentary, advertising banner whoring sites. Each site consists of nothing more than advertisements for click through revenue. These sites offer ads for MacMice, for Free iPods (read as scams), and a few Google Adsense ads (which I questioned here). When LoadPod first started; I inquired to be the local market affiliate. I was told someone had already filled the position. I called this person and they knew little about the iPod, Macs, and even electronics. I doubt the local affiliate for LoadPod has gotten much business, but I wish him well. LoadPod is essentially a CD to iPod digital transfer service. I decided to develop my own idea based around this concept, but stretching it into an all encompassing digital transfer service. I called it 3sinapod.com. I haven't really done much with the concept due to time constraints. But, it's a great idea. And, like many great ideas, when the inventor is the star of the show, it usually spells trouble. This is one reason I like Apple. Steve Jobs has a passion for inspiring creativity. This is his main motivation for any decision he makes. He doesn't get behind an invention because it will make Apple or Pixar billions - he gets behind something if he believes in it. He trusts his team of engineers to supply him with the products to make Apple a company to envy. I consider; Jack Campbell a genius at marketing, Nick Ciarelli a genius at writing, and Paypalsucks.com to be a genius move by the competition - these people are better suited as management. Bill Palmer is such a person. One thing all of these entities have in common - money is king. Money is their sole motivation. Damned be the way to get it. Each has a drive that is very uncommon. But the motivation is all to common - do whatever, however, whenever ... without forethought to integrity, ethics, or common sense - to get money. Instead of doing things to make people come to you (like Apple does) - these people do things at the expense of others and the very items they promote or the industries they serve. Wow, for not knowing who I am, you sure seem to know a lot about me. Interesting ... I googled his name with a few identifying terms as well and it comes up with a laundry list just like Jack's. I just read one of Bill's posts (on the MacMini) and I have to agree with JackWhispers that his writing borders on the nonsensical. I almost felt like I was reading one of John Dvorak's columns from PC Magazine. He is so far off the mark in his comments about the Mac Mini and so incredibly verbose at it. It appears that Bill has already posted here and will possibly read this. There is nothing wrong with posting your opinion online regardless of what your opinion is. However, if you are positioning yourself as an Apple advocate and posting for people's benefit, I have some suggestions for you to accomplish this. First of all, please be much briefer. Your article on the Mac Mini went on and on and I quickly lost interest in it. Make your point and move on to the next article. Write what's on your mind and then edit it down so that is digestible and accessible to those that read your articles. Second, substantiate your opinions with those of others online or in the public. You imply that employees at an Apple Store are so stupid that they would actually recommend a 20" display to a new Mac user. Come on. Additionally, even CompUSA employees that know little about Macs wouldn't point at an eMac and suggest that its a monitor only. Apple stores have keyboards and mice at the ready as do CompUSAs. Don't insult our intelligence by implying that people are idiots. They aren't. Back up your assertions with something that has actually happened. Third, take responsibility for your advertisers. If people like you and your website, they will naturally assume that you recommend your advertisers. Don't accept anyone and anything. If you want to post a diary-style blog, then you can advertise whatever you like, but when you are positioning yourself as a Macintosh resource, take some responsibility. Fourth, do some research. When I read JackWhispers and sites like it, I am immediately impressed by the fact that he has done research and cites his sources. I do not get the same impression from your site. The fact that you have been an Apple user for 12 years doesn't make you an authority or an expert; it does make you more knowledgeable than the dummy who would buy a Mac Mini and assume it has everything he needs in the box, however. Occasionally I can rant, but I don't claim to be running a major corporation either. This was somewhat my point and I thank you for clarifying it ... Bill's Site, as Jack's and Nick's, and the editor at PaypalSucks.com ... all appear to be endorsing the content and recommending it .... using their celebrity status ... without really knowing what they are talking about, citing sources, researching the topic at hand .... and therefore possibly causing problems for the very audience they are trying to serve. "It's a booming aftermarket of the iPod economy"
He's not even in the top 10 rip[ping services and EVERY time I have EVER seen a mention of these services in ANY venue (other than a loaded LOadPod statement from Bill) LoadPod is NEVER mentioned, ranked, or any way mentioned as being the first, second or 100th most popular. Nor, is it ever mentioned as one of the pioneering sites for this service.